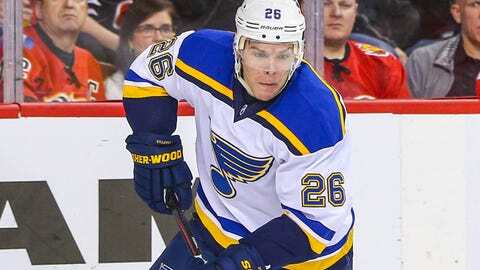 Paul Stastny suffered a lower-body injury Friday and will not play at Montreal. "We got some bounces tonight, and it just proves that when you do good things, good things happen. We were maybe a little sluggish at the start, but it’s good that we’re picking things up as the game goes on," Pacioretty told the team’s official website. "We’re inspired to keep getting better even with this great start." The Canadiens haven’t been giving up many chances with 25 shots or fewer allowed in four of six games, and their 26.5 per game is near the top of the league. St. Louis’ 25.0 mark leads the way. The Blues (5-1-0) will go with Jake Allen, who’s started 1-1-0 with three goals allowed in each game. He was given the starting job last postseason, but Brian Elliott has started four games this season and shown a bit more. Allen played both games against the Canadiens in 2014-15 with a 4.51 GAA and .830 save percentage. St. Louis has been consistent, scoring four goals in each game on its winning streak, and Sunday’s two-goal victory in Winnipeg included two from Vladimir Tarasenko. The 37-goal scorer from a season ago is off to a strong start with five goals and four assists.